In most arrangements, the function of the electric bass guitars is to provide the rhythmic and harmonic basis. Also, electric bass guitars usually have 4 strings. In addition, the strings are much thicker than those of the “ordinary” guitars. As a result, bass guitars produce deeper tones and a more striking rhythm. This type of guitars is probably the most suitable one for new players. The neck of a typical 4-string bass guitar is shorter than the standard one. As a result, this enables easier playing. Most importantly, these guitars are good for various music styles. However, choosing the best electric bass guitars is not so easy. We bring you a short guide with some important tips. Also, check our reviews of the six best electric bass guitars in the market. What to consider in 4 String Electric Bass Guitars? 4-string bass guitars are a true wonder. They are adorned by the beginners as they are easier to play than the bass guitar 5 string models. At the same time, professionals around the world play on different models of 4-string electric bass guitars. This type of bass guitar truly has lots of advantages over the other types. On the other hand, buying one is not so easy. There are certain factors to consider. Those depend on your level of expertise, requirements, and wishes. Also, it depends on your budget. Let’s get started. First of all, let’s make one thing clear. We cannot say that active pickups are better than the passive ones, nor vice versa. Certainly, it is all about the sound. It depends on your style and taste. Most importantly, you can play any kind of music with both active and passive pickups. However, when you crystallize your own style, you will know what you want. The key difference between these two types is the power source. While the passive ones don’t use a power source, the active ones need it. It is usually the battery. Furthermore, the active ones have a stronger output. The passive ones are simpler and have a more “traditional” sound. Some users have experienced that active pickups provide a sharper, clearer sound. Most of the players say that the soft, warm sound they get with the passive pickups cannot be easily produced with the active ones. Some players say that it is easier to play with active pickups. As a result, a part of the music world thinks that the active ones are good for rock and metal. On the other hand, passive pickups are, according to many, perfect for jazz and blues. When we talk about the 4-string guitar fretboard, there are several questions to answer. First of all. Which material is the best? Also, should I choose the C-shape or some other shape? Finally, what is the best radius? First of all, maple, rosewood, and ebony are the three best materials for the fretboard. Also, arched fretboards are proven to be the best choice as well. Similarly, the radius depends on the shape. Also, we must say that there are fretless bass guitars as well. We do not recommend this option for beginners for the reason that this would be too challenging and would slow down your learning process. First of all, there are three main types of the 4-string guitar necks. Those are the set neck, bolt-on neck, and the thru-body neck. Each type has its pros and cons. The set neck is perfect for players who love the sustain feature. It is also great for resonance. However, it has a flaw. It is rather difficult to adjust. Next, the bolt-on neck. This is the typical electric bass guitar neck type. Therefore, it is very strong and stable. Most noteworthy, it is the best choice for a good string vibration. Finally, the third type, thru-body neck, is reserved for high-end guitar models. Therefore, it is not very common in the market. The neck and the body represent a single piece. Most importantly, there are no bolts. As a result, this type accounts for excellent vibrations and responsiveness. The distance between the guitar bridge and the nut is called the scale length. Most noteworthy, it affects playability, sound, and number of frets. Similarly, it affects the ease of holding and maneuvering the guitar. There are two basic types of scale lengths. These guitars have a neck which is around 30 inches long. Beginners and young players almost always choose this type of guitars. It is easier to play them. These are typically 35 inches long. They have more frets and this is why it is rare to find a 4-string 35-inch scale bass guitar. There are several body types of electric bass guitars. The most common type is the solid wood body type. Certainly, maple, mahogany, and alder are the best ones. Why? The reason is simple: these types of wood transfer vibrations the best. However, these types are also the most expensive ones. Mahogany produces a warm, full, and pleasant sound. Emphasized lower register tones are a consequence of the low resonance capability of mahogany. Maple is excellent for sustain and bright tones. Professionals usually opt for this type of wood when it comes to the bass guitar body. Even tone balance is the strongest asset of alder. Rich harmony and resonance are its values as well. If you are looking for a cheaper version, opt for laminated or soft wood. Plastic bodies are not highly recommended by professionals and teachers. When it comes to the hollow bodies, such guitars are suitable for jazz. Also, bass guitar acoustic interpretations require this body type. The key advantage of this type is being lightweight. The key disadvantage is the limitation regarding the volume. Another very interesting type is the combination of bass guitar acoustic and electric type. You will recognize this type for its piezo pickups. The peculiarity of this type is the privilege of playing on a tonally adjustable acoustic model that can be amplified. Unfortunately, most of the beginners and hobby players choose their (first) guitar according to their budget. A general recommendation says that you should judge a guitar according to its price. However, this does not have to be true in all cases. There are some great models of electric bass guitars in the market at affordable prices. Check our product reviews section for more information. Ibanez, a company based in Indonesia, is well-known for guitars suitable for fast and easy playing. 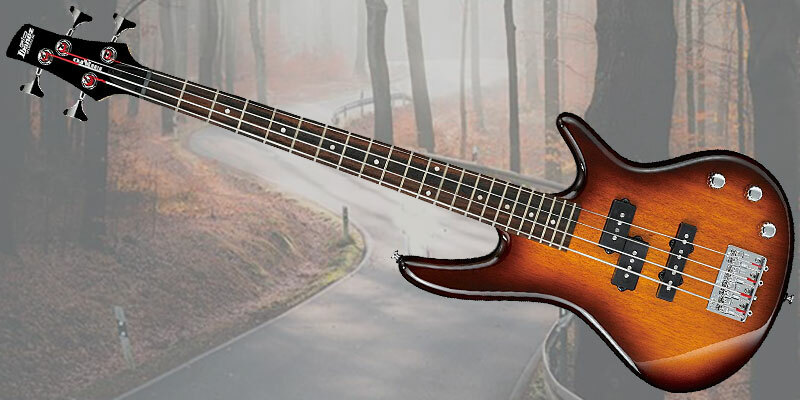 This time, Ibanez presents a high-quality, 4-string bass guitar. 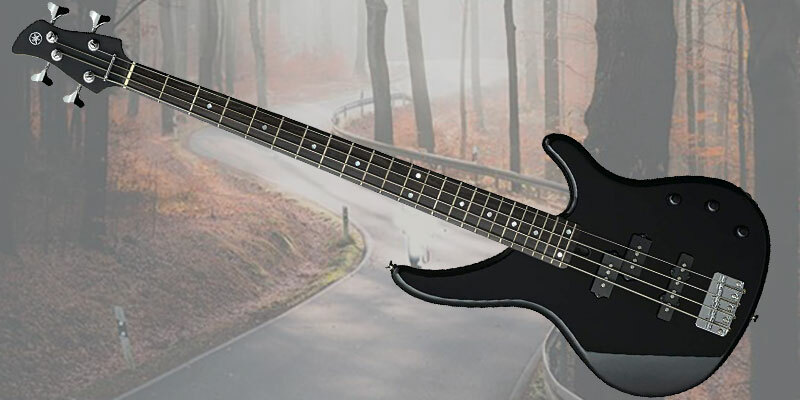 The GSRM20BS model is a lightweight, short scale bass guitar. It is a very slim and elegant guitar. Most noteworthy, this model is very comfortable and compact, due to its slim body. Also, it has a slim neck which allows extra manoeuvring and faster playing. Furthermore, the contours of this guitar are smooth. This allows super-close contact. In addition, this guitar has a beautiful sound. Therefore, it is perfect for those who love deep sound. Also, the tones are very customizable. Similarly, the Dynamix J and P pickups, as well as tone controls allow excellent sound. Its single-piece, maple neck and 22 medium frets allow easy playing. Also, the guitar has 4 strings. In addition, the fretboard material is rosewood. It has a fixed bridge system. Finally, this is a 28.6-inch guitar. As a result, it is perfect for travelling. Also, it is good for users with limited space. It weighs 6.9 pounds. In addition, players with small hands often choose this guitar. Furthermore, this is a very good bass guitar for beginners. If you also think about a 4 string acoustic Ibanez bass guitar, you may click here. Good for players with small hands. Some users report fret buzz. If compact, short-scale electric bass guitars are your preference, look no more. Ibanez has the right model for you for the reason that it is easy to play. Also, you can play fast. In addition, it is lightweight. Finally, this guitar is good both for beginners who want to feel the joy of playing and for professionals. Davison Guitars and Basses are well-known for quality products at affordable prices. They often incorporate elements peculiar for expensive guitars. Users adore this brand for many accessories that come with high-quality products. 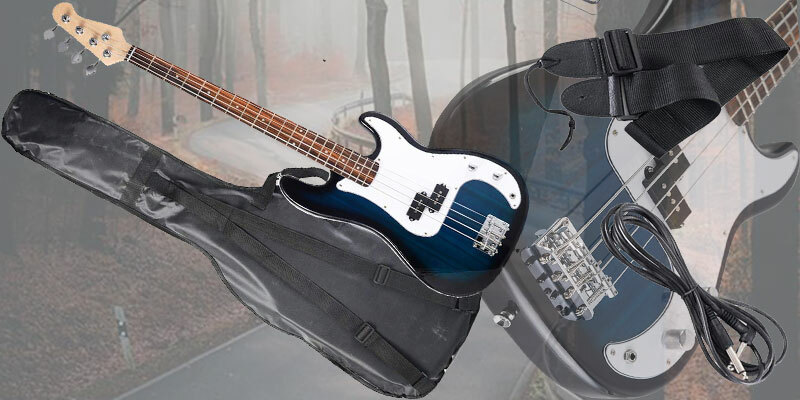 This full-size pack bass guitar with amp case for beginners is not an exception. This is a full-size electric bass guitar. It comes with a 30-Watt bass guitar amp, a case, and a strap. In addition, buyers get the cable for free. This starter pack is often chosen by beginners as it is recommended by teachers. It has everything one needs to start playing. This is a right-handed guitar made from solid wood. The fretboard is made from maple. The neck is also made from maple. It has four strings. The pickup configuration is dual. This product belongs to the low-price range bass guitar set. It is very affordable. Furthermore, it comes with so many accessories that it definitely pays off. Buyers get a guitar strap and the picks too. The sound is pretty good. However, the amp could have more features. This is why this is the perfect choice for the beginners, but not for professionals. The strap is too small. If you are a beginner looking for a starter pack, this is a very good, affordable solution. You will get the guitar, the amplifier, a case, straps, and the picks. In contrast, if you are an intermediate or advanced player, you should invest in a more professional product. This is a full-scale electric bass guitar. It has a very attractive design. Furthermore, it comes in two different color combinations. Those are: black and white, dark blue and white. This guitar’s wooden body provides durability, as well as a solid touch and feel. The body is not made of 100 % pure wood. It is rather a combination of wood and laminated wood. Furthermore, the guitar has a smooth, polished, shiny finish. The fretboard is made of rosewood. Also, the neck is made of rosewood. The guitar has 4 strings. The bridge system is tremolo. Most noteworthy, the guitar has the piezoelectric pickup configuration. In addition, it has a 3-ply pick guard. Also, it has a very solid cable jack. The sound of this guitar is smooth and warm. Therefore, it is good for both blues and rock. 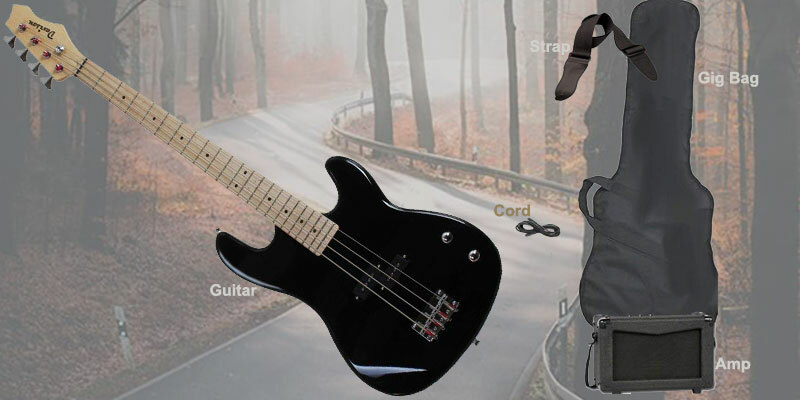 This is a pack which consists of a guitar, its bag, strap, bass pick, and the amplifier cord. Consequently, it is suitable for players who travel or carry their guitar to rehearsals and concerts. This is one of the cheapest bass guitars Amazon offers. Also, it has one of the best pack bass guitar price deals in the market. Therefore, beginners often choose this pack. Finally, this is one of the best electric bass guitars for beginners and lower-intermediate level users. Most noteworthy, it provides a good, warm, and versatile sound. Also, the pack consists of many accessories. In addition, it is an affordable and durable product. 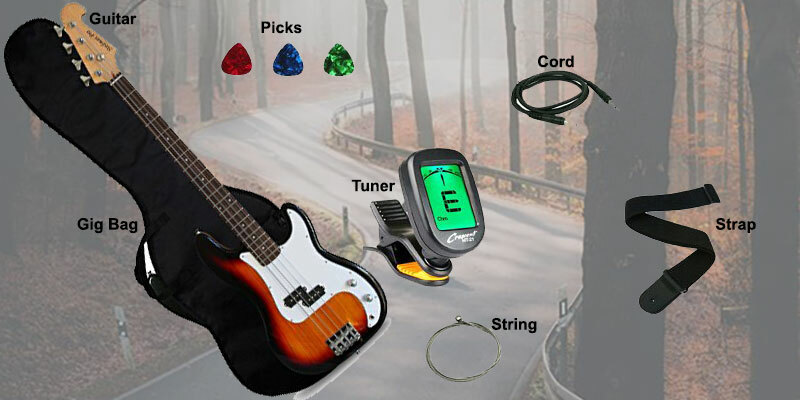 This starter kit consists of a 43-inch, full-size electric bass guitar, a digital e-tuner, a strap, a case, a set of extra strings, a cable, and three picks. Also, it weighs 9.8 pounds. First of all, this is a basswood body, rosewood fretboard, and a maple neck electric bass guitar. In addition, it has 20 frets and elegant design. Furthermore, it has Split P-B P/U magnetic pickups. Most noteworthy, users value its quality tone and volume controls. Finally, this is a right-handed, 4-string guitar. Also, it has a good, solid, ¼-inch jack. Even more, it is compatible with most of the music equipment. Most importantly, users state that it is easy to play this guitar. The case is rather low-quality. Finally, this is one of the best electric bass guitars for a beginner or a hobby player. Also, it comes with lots of accessories and has a good sound. Most importantly, it is very affordable and durable bass guitar. If you are looking for a trusted brand, we highly recommend this model. Hence, TRBX174 BL is a high-quality, 4-string electric bass guitar by Yamaha. Certainly, it is a great value for the price. First of all, this guitar has an elegant mahogany body. Similarly, it has a vintage bridge and,as a result, an appealing overall design. Yamaha is well-known for precision and flawless design. As a result, this model is not an exception. Above all, high-quality craftsmanship, superb materials, and quality engineering are the foundations of this guitar. Most importantly, very good playability and durability are two of its key qualities. Its sonokeling fretboard is rarely found in the market. Furthermore, it is accompanied by a high-quality mahogany body and a maple neck. It has a single-coil pickup system. Also, the bridge system is individual and adjustable. Most noteworthy, you can easily switch between the passive and active pickups. This product weighs 11.8 pounds. It is made in Indonesia. This is a high-quality guitar. Most noteworthy, it has a full and warm sound. Also, users appreciate the possibility of using both active and passive pickups. 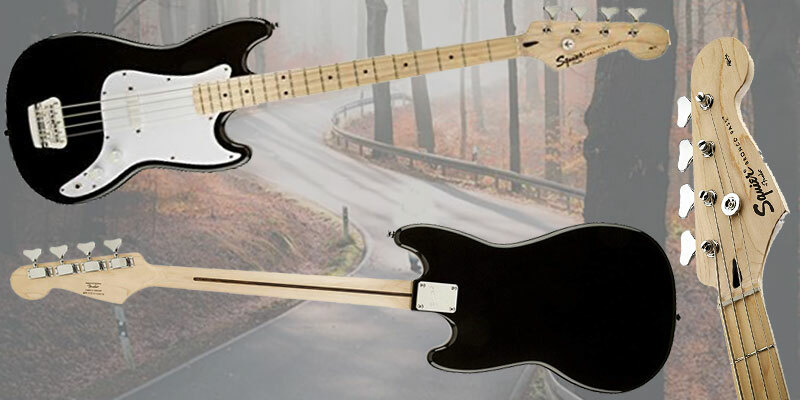 Finally, it is an electric bass guitar suitable for both beginners and advanced players. This is an elegant, classic-look guitar by Fender. Therefore, if you are looking for a trusted brand, excellent warranty, and quality, we highly recommend this product. First of all, this guitar has an elegant, classic body made from Agathis. Another important detail: it is covered with a polyurethane finish. Therefore, it has a glossy finish. Furthermore, this is a guitar with a 30-inch neck. As a result, it provides a feel and touch of a short-scale guitar. The fretboard is made from maple. It is C-shaped. In addition, it has a 9.5-inch radius. As a result, this is enough to accommodate 19 medium-jumbo frets. Most noteworthy, this electric bass guitar has 1 single-coil pickup and a 2-saddle bridge made from chrome. Finally, this is a 4-string, right-handed guitar. Also, it weighs 11 pounds. Therefore, it is often chosen by players with small hands. Similarly, this is one of the favourite options for beginners. Shipped only to the USA. Finally, this is a high-quality electric bass guitar perfect for beginners, intermediate level and hobby players. Also, teachers recommend it. Similarly, it is good for hobby and semi-professional bands too. Most noteworthy, it has a very full and rich sound. Above all, it is easy to tune and control. The versatility of 4-string electric bass guitars is proven by the fact that a wide range of players choose it. It is the first choice of beginners, as well as a guitar type adorned by professionals. Finally, these guitars’ key peculiarity is easy handling and comfortable playing experience. Therefore, our experts tried and reviewed some of the best electric bass guitars according to different criteria. As a result, we have come up with a buying guide and some tips on choosing the perfect model depending on your needs.